My nephew is at that equally adorable yet 'a bit of a handful' stage. A year and half, where curiosity and mobility collide. It's hard to keep the little guy quiet or still for very long, and that's the dilemma my sister has been running into during those times when she really needs him to do just that. I've heard of those soft plush books made of fabric or felt, full of small quiet activities to keep a child entertained and interested for a time. I always thought I'd like to make one and so after searching Pinterest for some inspiration I wanted to share what I did. 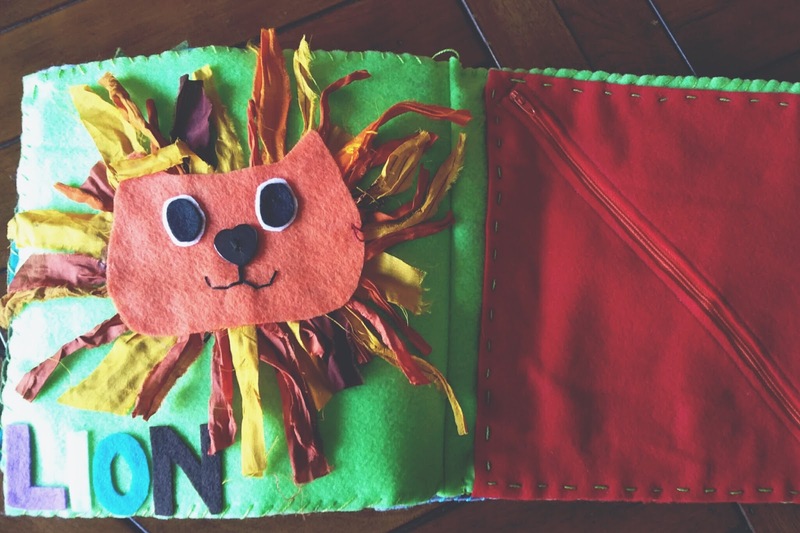 After a few days and countless hours, I pumped out my first attempt at a quiet book for my nephew. I opted to have each page be a 10 x 10 inch square. So when I cut the felt with a ruler and x-acto knife I was actually cutting out 10 x 20 inch rectangles. I also choose to work with felt because it's inexpensive, colorful, I had it in large quantity, and it's extremely forgiving with cuts and hand stitches. Each rectangle I folded in half and sewed in a straight line (from top to bottom) 1/4 of an inch from the fold with my sewing machine. The first page is one of my favorites. On the left is my idea, on the right is definitely not my idea. Sadly I can't take credit for the dinosaur awesomeness. It's from a pattern, created by an awesome, no probably the best quiet bookmaker I've ever seen on the Internet: Stephanie of the blog Imagine Our Life. 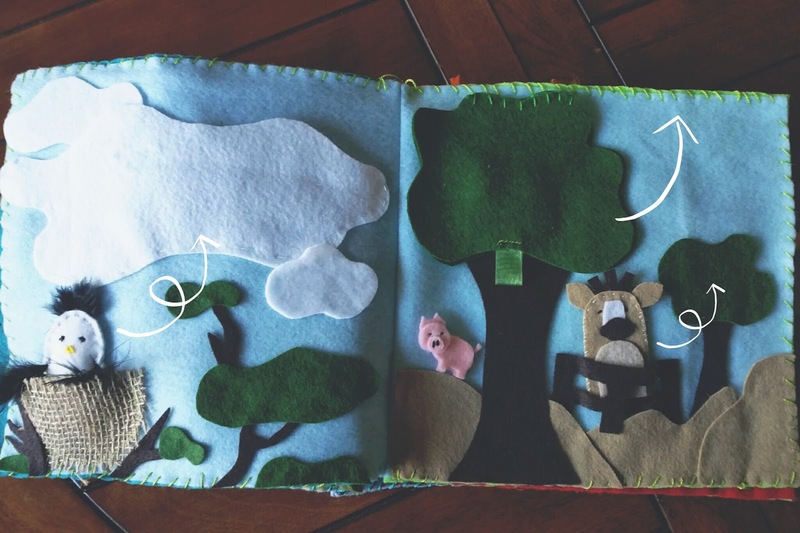 She has TONS of clever quiet book page ideas and patterns! I stumbled upon this Dino page on Pinterest and knew I had to include it in Oliver's book because, like his uncle, he loves dinosaurs. Imagine Our Life's version puts mine to shame though, as mine is lacking many elements including the adorable embroidered dinosaur sound words. 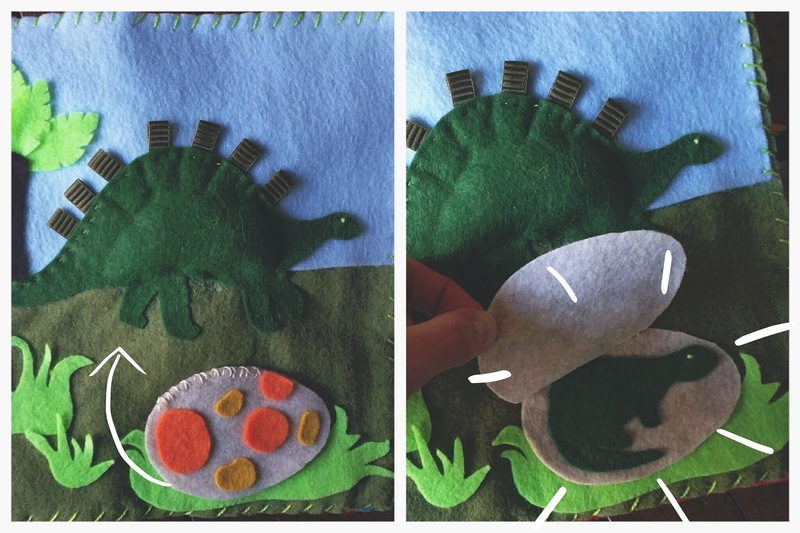 Key to a quiet book is the inclusion of things to do not just things to look at, so I did make sure to keep the egg opening to reveal a baby dino idea. 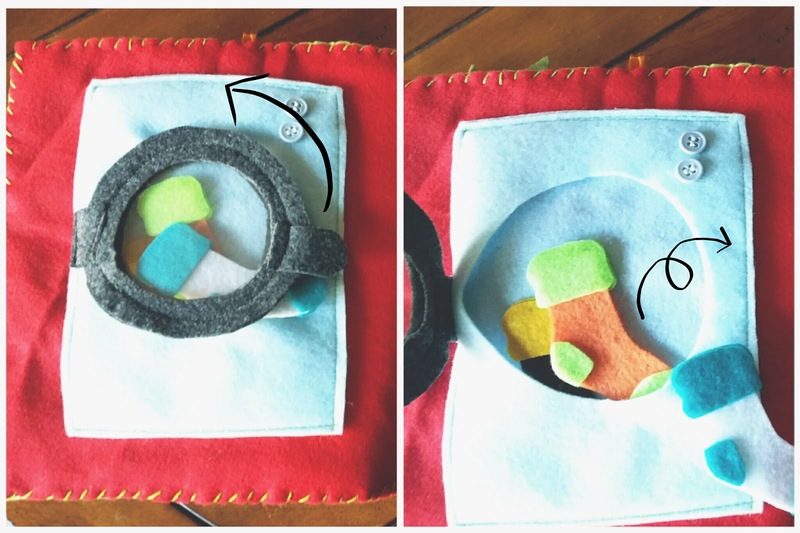 I saved a lot of time not just on this page but on many of the others by utilizing felt glue instead of sewing each and every item to the page. 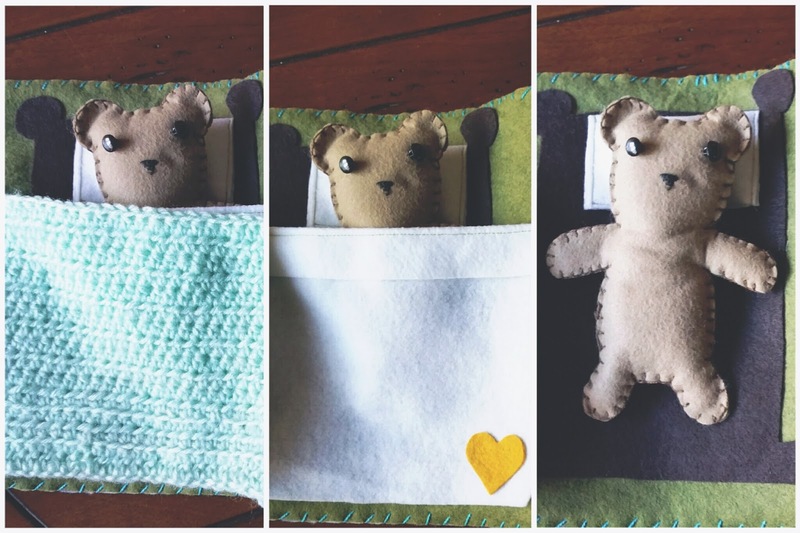 My 'put the bear to sleep' page was inspired by my desire to utilize the texture of crochet somewhere in the book. 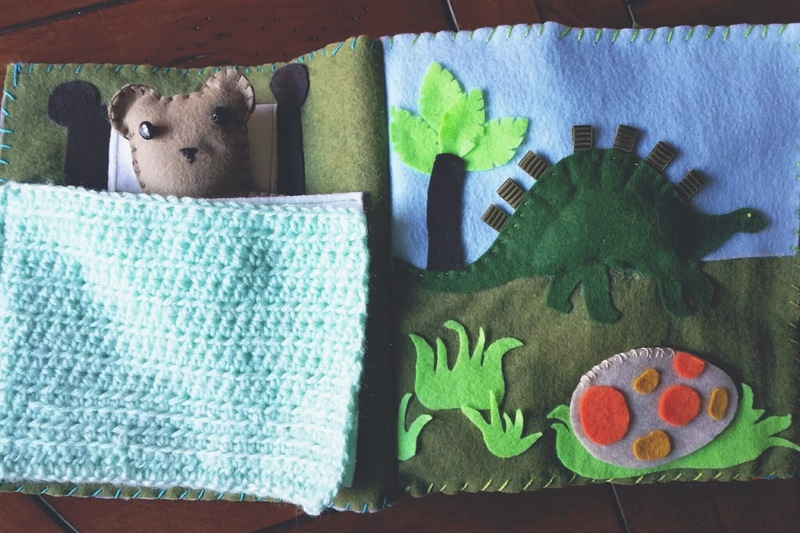 What better way than a cozy blanket for a cute little stuffed friend that my nephew could play with even outside the book. This bear and bed was complete with a sheet too. The bear and pillow were lightly stuffed with batting. The next page was inspired by two things. First, every time we go to Target, Oliver just has to swipe our card for us at checkout. And secondly, my mom recently told me that the only thing that kept him quiet for more than a few minutes was a couple of credit cards in the outside pocket of a purse. So I figured he needed his own card to swipe! The fruits (banana, apple, orange) and veggie (broccoli) are all removable. When I showed Oli that the banana "peels" he tried to take a bite. So cute! That boy really loves his bananas! Another thing my nephew loves is lions! Well any jungle cat really, tigers, cheetahs... The lion face I created was inspired by this and this. Instead of rick rack and ribbon I used various lengths of sari cloth ribbon and a heart shaped button for a nose. 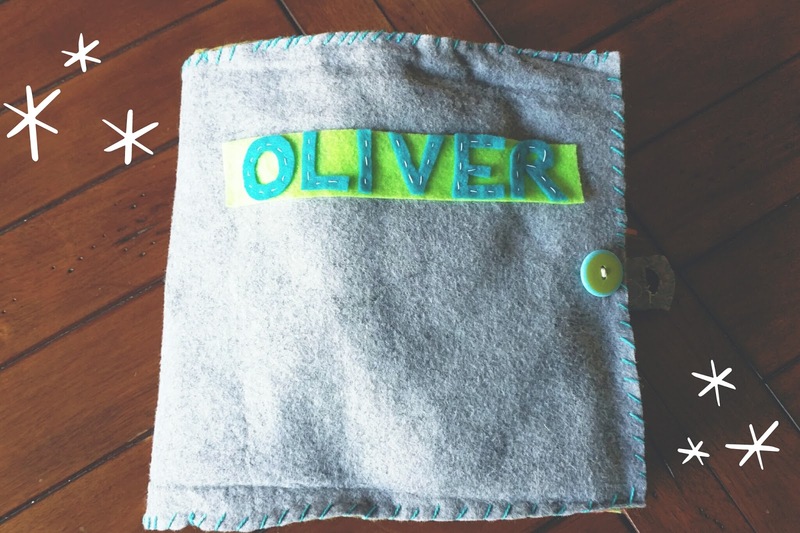 On the opposite page I created a zipper pocket for Ollie to store whatever he wants inside but in the meantime I placed a laminated picture of our family inside. The last page is a simplified version of two pages from patterns from the blog Imagine Our Life. The mailbox and letters page and the sock matching page. Again I did cut a lot of corners to save time, also I didn't have all of the supplies like magnets to turn the socks into a matching game. But I love the little mail. Little felt envelopes that actually have little felt letters inside! Check out the super fun two page spread of the sock matching game Stephanie created here. I love all the varieties of socks she has as well. If there is one page I'd do again it'd be this one. After the items on each page had been glued and dried or sewn on, I stacked each folded page on top of the other evenly, matching the edges. Then two at a time, I whip-stitched with embroidery thread all around the edges joining the pages together. When I cut out the cover I cut it a couple inches wider to allow for the thickness of all the pages and I also cut out a tab on the right side to affix a button to, so the book could be fastened closed. That's basically in a nutshell what I did to make my nephew his first quiet book. I think I've caught the quiet book fever now, and I'm thinking of all kinds of new fun pages. I think I'll take my time and make Oliver a second more elaborate book next time. Maybe using different materials and snaps. What do you think? Did anyone have a quiet book when they were a kid? 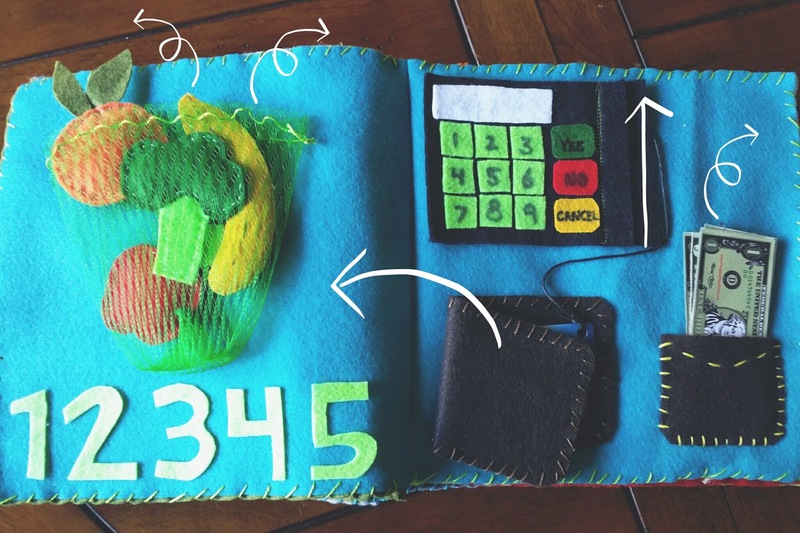 Or do you want to make a little one in your life their own book? 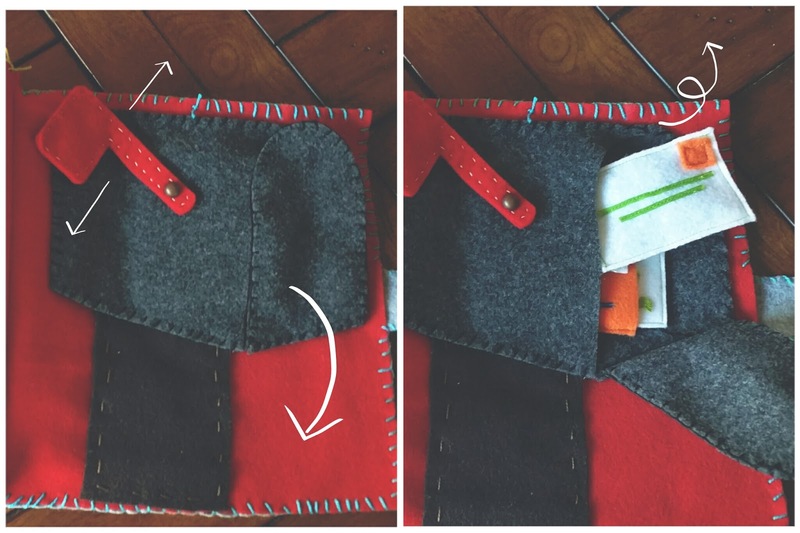 Check out more kiddo DIY ideas on my Pinterest board here.